It's that time of year when it seems as though every other person is ill so I thought I'd share my go-to elixir for when I'm under the weather, Miso Soup. This comforting broth is packed full of goodness and only takes 15 minutes to make from scratch. It's traditionally served with tofu but I'm not the biggest fan so have substituted mushrooms. 1) Bring 1 litre of water to the boil in a saucepan over a medium high heat on the hob. Add the nori and boil for 5 minutes. 2) Meanwhile, heat the vegetable oil in a small frying pan over a medium heat on the hob. Add the mushrooms and lightly fry for a few minutes to soften. 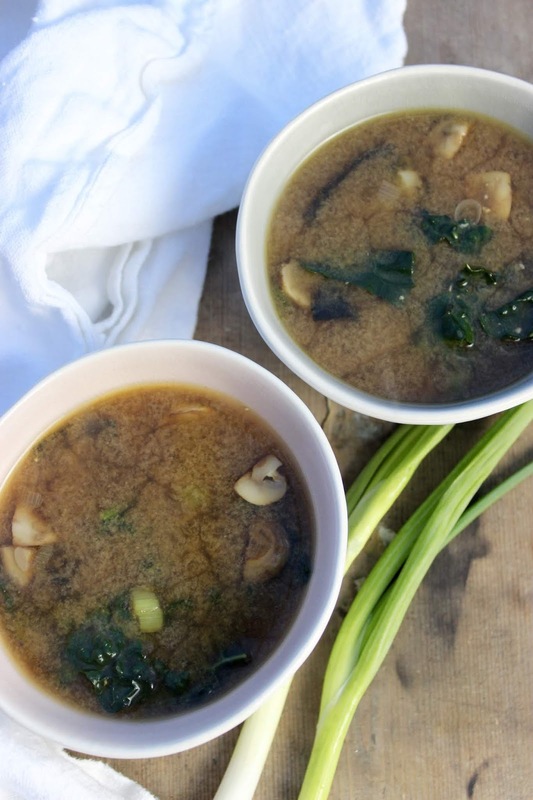 3) Add the mushrooms to the nori water, along with the greens & spring onions, and boil for a further 5 minutes, before stirring in the miso.